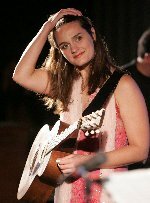 On Friday night I was in York with James seeing Madeleine Peyroux play live at the Royal Opera house. Aside from the debacle that was not knowing exactly where the beautiful but tiny venue was situated it was an amazing evening. Madeleine has recently become quite popular and ever since she appeared at the North Sea Jazz festival her music has been getting more and more good reviews. In fact shes now so popular that her gigs sell out over a month in advance. This was the first concert I’ve had to get tickets from ebay for! It was worth it though because I missed her performance at North Sea and so was dying to see what her music was like in a live and vibrant setting such as York. At the start of the concert we were treated to a very enjoyable support act, a jazz vocalist and pianist who I’m ashamed to say their names escape me. If anyone was there or knows who the support act was, please get in touch in comments because her music was very similar to that from Diana Krall – an artist I admire very much. So after a short interval (during which we passed comment on how impossible it was sitting where we were with people getting up and down all the time like yo-yos) Madeleine Peyroux graced the stage with her presence causing a large round of applause from the crowd. Her style is wonderfully varied, interspersing her songs with just the right amount of chit-chat to keep you informed but not bore you with details. Shes a great all round jazz singer with the ability to stir your soul with the softest and most inspiring melody and yet 5 minutes later have you tapping your foot to a rock influenced number straight off the electric guitar. Her band are exteremly talented also, complementing her vocals and guitar work perfectly. I paid particular attention to the pianist who in addition to being an amazing musician at the grand was also a superb keyboard player and a dab hand on the hammond organ. As we all know, you can’t beat a bit of organ vibes to punctuate that typically blues piece. As I’ve already said her sheer variety was very enjoyable to listen to, but she managed to top it all off in the encore by performing a perfect piece in French which I felt was one of the best songs of the night – clear, crisp, melodic and deeply beautiful it was the end to a perfect jazz concert. All I can say really in conclusion is that the critics are not wrong when they say Madeleine has a beautiful voice, they’re not wrong when they say she sings with an awesome band and I’ve never felt more certain about a review conclusion when I say you certainly cannot afford to miss her live if you are a fan of vocal jazz. Hi – I was also at this gig so read your review with particular interest and surprise….wonderful musicians, charming and interesting support and I also do not have their names….but Madeleine? I arrived a fan and left feeling very concerned. I don’t think she likes her life at all. I don`t think she likes performing. Only on the encore did she liven up – playing French Hot Club/Folk type of stuff which she grew up with perhaps? Other than that she seemed to be on a depressed ride of record label inisistence that she goes out and does jazz stuff cos her voice co-incidentally sounds like olde worlde jazz singers a la Billie Holiday etc. She hardly ever spoke to the audience and made me feel uncomfortable for her sulky demeanour the whole way through. I guess it won`t be long before she runs off again…and I did not enjoy watching her suffer. Interesting opinions and ones that I’m not going to dispute because to be honest I cannot remember the concert all that clearly now. I do remember that she seemed to be quite reserved on stage but then some artists are like that when they perform live. I remember seeing Maria Rita at last years North Sea Jazz festival and she wasn’t all that talkative but none the less put out a good performance. Personally I feel that it is possible for a musician to be able to write and play great music but at the same time be nervous when performing it in front of a large audience. Perhaps this is the case for Madeleine? I also don’t really recall her being sulky, I mean at least not in the way you describe, I just had her down as a quiet type of person who felt more comfortable playing than talking. I can’t comment if the record labels have forced her current style upon her but I do think it suits her. I wouldn’t imagine that anything has been forced upon her though as her debut album (released before anyone even really knew her as an artist) was of the style she is playing now and I wouldn’t have imagined she would have embarked on recording those songs if her heart wasn’t in it.